As we close in on 2018, direct mail still remains one of the most effective marketing methods in terms of generating a response from customers. The response rate is high compared with other marketing channels, and this year the Direct Marketing Association recorded the highest response rates for direct mail since 2003. It’s clear that direct mail still reigns supreme in the eyes of consumers (especially with Millennials, with a response rate of 12.4 percent!). The following are just some of the advantages traditional direct mail has over alternative marketing channels. Direct mail can be targeted. Your target audience can be segmented using a wide range of attributes such as geographical area, income, age, gender – the list goes on! Tailoring your campaign to suit a specific audience will increase response rates by reaching the right doorsteps and avoiding the wrong ones. You can personalize your mail pieces. With variable data printing capabilities, it’s extremely easy to add personalized touches to your marketing messages. By adding something as simple as a name to your mail piece, your customers are more likely to pay attention to your message, and act on it too! Did you know? Adding a person’s name, and using full colour in direct mail, can increase the response rate by 135%. Mail is tangible. Unlike most passive digital mediums, direct mail is delivered directly to customers’ and prospects’ doorsteps and therefore you can almost guarantee they see your message. People are also less skeptical of direct mail. Its contents are seen as more reliable because you can physically touch the piece of mail and the postal service is a widely known and trusted civic institution. You can choose from a variety of media formats—from postcards and magazines, to catalogues and brochures—meaning there’s a suitable strategy for any campaign. You can even create a dimensional mail piece by adding a sample or simply sending trial products in a box. The opportunities to create mail pieces that stand out are endless! Our direct mail experts can help tailor your mailer to meet your company’s needs and maximize your campaign’s results. Did you know? At 6.6%, oversized envelopes have the greatest household response rates compared to other mediums. 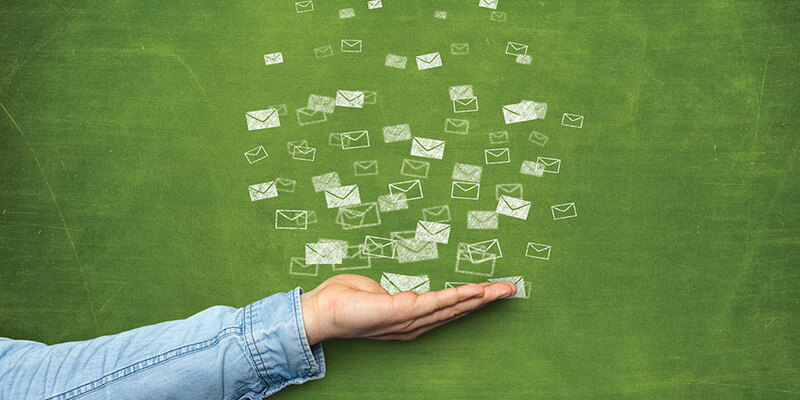 Direct mail is most powerful when used in conjunction with other marketing channels. You can capture different audiences that may not have seen your marketing message had it only been circulated through one channel. Even better, some people are exposed to your message at multiple points, which is proven to boost response rates and brand recognition. Did you know? Brand recall is 40% higher if you follow an email with a direct mail follow-up. Leech Printing is a Canada Post Smartmail Marketing Partner. Contact your sales representative to ask them how we can help you target your ideal customers with Direct Mail!